New Headline Tour Information Coming Very Soon! This video is premiering in advance of METALACHI‘s new, third full-length album, Tres. The album will be released on November 11 via all digital platforms and www.metalachi.com. The album features covers of songs originally performed by artists such as Judas Priest, Dio, Journey, Guns N’ Roses and more! See below for a full tracklisting. In celebration of the album’s release, METALACHI will headline an official album release party on Saturday, November 10 at the House of Blues in Anaheim, CA! The show is presented by 96.7 FM KCAL Rocks and will begin at 7:00 PM, with tickets starting at $12. Visit this link for more information! 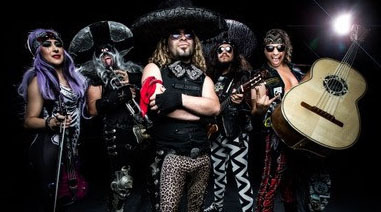 METALACHI has been featured on America’s Got Talent, CNN’s Great Big Story, Rolling Stone en Español, BBC’s Outlook via NPR, Huffington Post, and National Geographic, and their music has been heard on FX’s The Bridge and in a new TV commercial for DirecTV. METALACHI has been named one of the 10 best Mexican Metal Bands worldwide by OC Weekly, was named #4 on a list of the top 20 tribute bands based in Los Angeles by LA Weekly, andwas voted as one of the best live shows in Southern California by Examiner.com.